The insistent beat of Netronome! Last week I popped into to visit Netronome in their Cambridge office and was hosted by David Wells their VP Technology, GM Europe who was one of the Founders of the company. The other two Founders were Niel Viljoen and Johann Tönsing who previously worked for companies such as FORE Systems (bought by Marconi), Nemesys, Tellabs and Marconi. Netronome is HQed in Pittsburgh but has offices in Cambridge UK and South Africa. 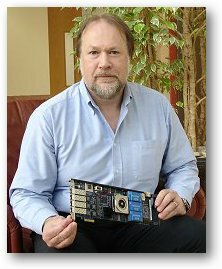 I mentioned Netronome in a previous post about network processors – The intrigue of network / packet processors so I wanted to bring myself up to date with what they were up to following their closing of a $20M ‘C’ funding round in November 2006 led by 3i. Netronome manufacture network processor based hardware and software that enables the development of applications that need to undertake real-time network content flow analysis. Or to be more accurate, enable significant acceleration and throughput for applications that need to undertake packet inspection or maybe deep packet inspection. I say to to be more accurate because it is possible to monitor packets in a network without the use of network processors using a low-cost Windows or Linux based computer, but if the data is flowing through a port at gigabit rates – which is most likely these days – then there is little capability to react to a detected traffic type other than switching the flow to another port or simply blocking it. If your really want to detect particular traffic types in a gigabit packet flow, make an action decision, change some of the data bits in the header or body, all transparently and at full line speed then you will undoubtedly need a network processor based card from a company like Netronome. The Intel powered 16 micro-engine used in Netronome’s products enables the inspection of upwards of 1 million simultaneous bidirectional flows. 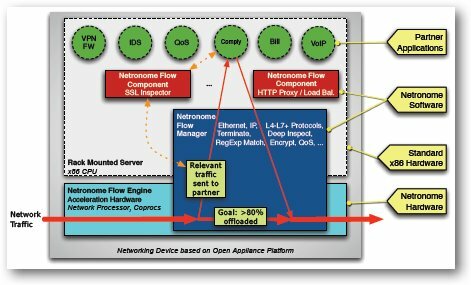 Netronome’s product is termed an Open Appliance Platform. Equipment vendor companies have used network processors (NPs) for many years. For example Cisco, Juniper and the like would use them to process packets on an interface card or blade. This would more than likely be an in-house developed NP architecture used in combination with hard-wired logic and Field Programmable Gate Arrays (FPGAs). This combination enables complete flexibility to run what’s best to run in software on the NP and use the FPGAs to accommodate possible architecture elements that may change – maybe due to standards being incomplete for example. Other companies that have used NPs for a long time make what are known as Network Appliances. A network appliance is a standalone hardware / software bundle often based on Linux that provides a plug-and-play application that can be connected to a live network with a minimum of work. Many network appliances are simply using a server motherboard with two standard gigabit network cards installed and Linux as the OS with the application on top. These appliance vendors know that they need the acceleration they can get from an NP, but they often don’t want to deal with the complexity of hardware design and NP programming. Either way, they have written their application specific software to run on top their hardware design. Every appliance manufacture has taken a proprietary approach which creates a significant support challenge as each new generation of NP architecture improves throughput. Being software vendors in reality, all they really want to do is write software and applications and not have the bother of supporting expensive hardware. This is where Netronome’s Open Appliance Platform comes in. Netronome has developed a generic hardware platform and the appropriate virtual run-time software that enables appliance vendors to dump their own challenging-to-support hardware and use Netronome’s NP processor instead. The important aspect of this is that this can be achieved with minimum change to their application code. 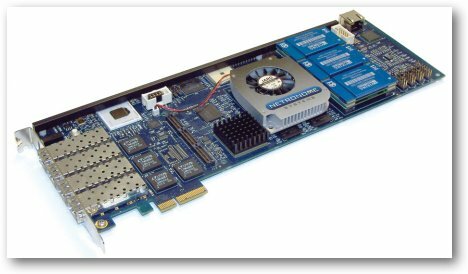 What are the possible applications (or use cases) of Netronome’s Network Acceleration card? The use of Netronome’s product is particularly beneficial as the core of network appliances in the following application areas. Security: All type of enterprise network security application that depends on the inspection and modification of live network traffic. SSL Inspector: The Netronome SSL Inspector is a transparent proxy for Secure Socket Layer (SSL) network communications. 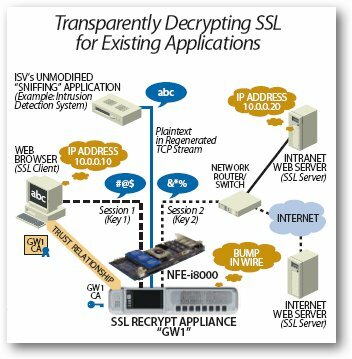 It enables applications to access the clear text in SSL–encrypted connections and has been designed for security and network appliance manufacturers, enterprise IT organizations and system integrators. The SSL inspector allows network appliances to be deployed with the highest levels of flow analysis while still maintaining multi-gigabit line-rate network performance. Compliance and audit: To ensure that all company employees are in compliance with new regulatory regimes, companies must voluntarily discover, disclose, expeditiously correct, and prevent recurrence of future violations. Network access and identity: To check the behaviour and personal characteristics by which an individual is defined as a valid user of an application or network. Intrusion detection and prevention: This has always been a heartland application for network processors. Intelligent billing: By detecting a network event or a particular traffic flow, a billing event could be initiated. Innovative applications: To me this is one of the most interesting areas as it depends on having a good idea, but applications could be, modifying QoS parameters on the fly in an MPLS network or detecting particular application flows on the fly – grey VoIP traffic for example. If you want to know about other application ideas – give me a call! Netronome Flow Drivers: The Netronome Flow Drivers (NFD) provide high speed connectivity between the hardware components of the flow engine (NPU and cryptography hardware) and one or more Intel IA / x86 processors running on the motherboard. The NFD allows developers to write their own code for the IXP NPU and the IA / x86 processor. Netronome Flow Manager: The Netronome Flow Manager (NFM) provides an open application programming interface for network and security appliances that require acceleration. The NFM not only abstracts (virtualises) the hardware interface of the Netronome Flow Engine (NFE), but its interfaces also guide the adaptation of applications to high-rate flow processing. Netronome real-time Flow Kernel: At the heart of the platform’s software subsystem is a real-time microkernel specialized for Network Infrastructure Applications. The kernel coordinates and steers flows, rather than packets, and is thus called the Netronome Flow Kernel (NFK). The NFK also does everything the NFM does and it also supports virtualisation. Open Appliance Platform: Netronome have recently announced a chassis system that can be used by ISVs to quickly provide a solution to their customers. If your application or service really needs a network processor you will realise this quite quickly as the the performance of your non-NP based network application will be too slow, is unable to undertake the real-time bit manipulation you need or, the real killer, it is unable to scale to the flow rates your application will see in real world deployment. In the old days, programming NPs was a black art not understood by 99.9% of the world’s programmers, but Netronome is now making the technology more accessible by providing appropriate middleware – or abstraction layer – that enables network appliance software to be ported to their open platform without a significant rewrite being necessitated or a detailed understanding of programming an NP. Your application just runs in a virtual run-time environment and uses the flow API and the Netronome product does the rest. Good on ’em I say. This entry was posted on Thursday, March 15th, 2007 at 9:30 am and is filed under All, Company reviews, Internet, Networks, Semiconductor, Software. You can follow any responses to this entry through the RSS 2.0 feed. You can leave a response, or trackback from your own site. One Response to The insistent beat of Netronome!